With a history since 1920, “Tokyo-Hakone Daigaku Ekiden,” or a Japanese long-distance relay race by collegiate is a main and popular event during the New Year holidays, Jan. 2nd and 3rd. “Ekiden” is originated in Japan. The Japanese term originally referred to a stagecoach. Five athletes from each collage run about 108km from Otemachi in Tokyo to Ashinoko for Hakone Ekiden. Spectators are piled and cheer runners along the course. And, the television ratings for the program exceeded 20%. 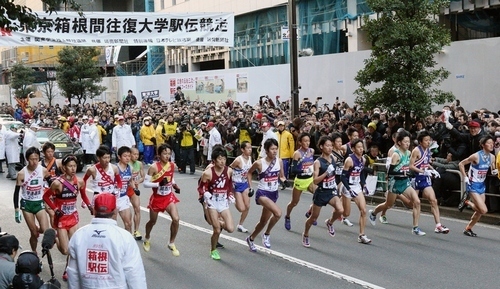 Annual Ekiden relay race by adult is held on Jan. 1, just a day before Hakone Ekiden. Even though it is known for its high level than Hakone Ekiden, Japanese are more excited with Hakone Ekiden which all participants are college students. 20 universities participate for this year, and Nippon Taiku College wins the championship for the first day and the overall champion will be announced tomorrow. I cannot miss a thrilling relay race tomorrow, but I will introduce another way of enjoying Hakone.